The clock crafted in antique bronze metal and decorated with hammered detailing on the cover. 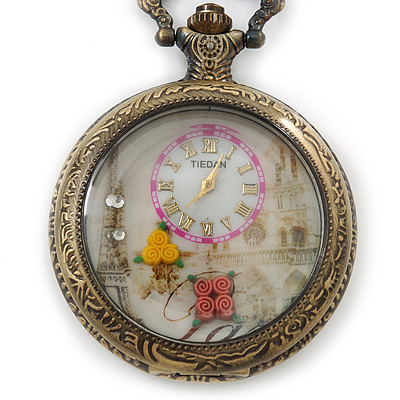 The clock face decorated with Eiffel Tower and floral motif and accented with two clear crystals for a dash of sparkle. It measures about 45mm in Diameter and attached to the 80cm chain. You can put it on as a clothes accessory to match your sweater, dress, T-shirt. You also can use it as a watch. Antique style pocket watch is suitable for also men and women. It not only is a beautiful pocket watch also is an elegant necklace. If you are looking for clothes accessories or presents, this pocket watch is your best choice!